Be inspired by the stories of these four scholars who have strived to initiate positive transformation in their lives. (From left to right) Senior product manager of Fly Ace Zen Prudentino; CEF scholars Jonathan Domasig, Dinayen Monterero, Catherine Mendoza, and Edureal Ledda; and Fly Ace’s marketing and associate PR and marketing manager MJ Cordova. For young learners from low-income families, the ever-increasing costs of a college or vocational education is a constant struggle. But now, thanks to the support of corporate sponsors and the Culinary Education Foundation (CEF), the advocacy arm of The Cravings Group, access to quality free education is attainable for those who aspire for bigger dreams for themselves and their families. This reality best demonstrates the inspirational stories of Catherine Mendoza, Edureal Ledda, Dinayen Monterero and Jonathan Domasig, as they overcame the challenges of poverty through the CEF scholarship grants. Together with their fellow CEF recipients, they are expected to see their efforts rewarded come graduation this December. 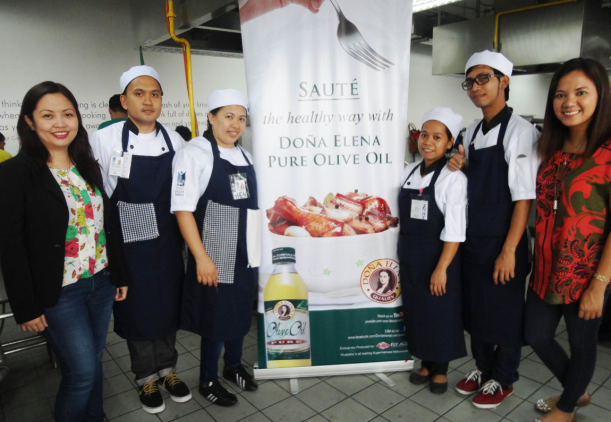 The four are among the chosen 200 scholars that benefited from the Manila Food and Wine Festival (MFWF) Charity Gala Night of CEF last October 2014. These four scholars were chosen to represent the 1st batch of Doña Elena Brand Scholars of Fly Ace Corp., through the leadership of its EVP for Sales and Marketing, Larry Cochanco. Doña Elena brand was among the major sponsors that committed financial support that helped successfully raise substantial academic stipend for the Batch 8 and incoming Batch 9 of CEF scholars. To date, more than a hundred individuals–out-of-school youth, mothers, and members of indigent communities–have successfully finished and benefited from the free culinary education, career, and livelihood programs of CEF. The story of the scholars started no differently from those coming from poor families. Just a few years ago, they are among those who couldn't imagine attaining higher vocational learning–let alone quality culinary education–as they struggle to provide for their families. But by virtue of the CEF scholarship, they were given the opportunity to transform their lives and those that they love. They received holistic educational and core competency training support to ensure their successful transition into the food industry. Ledda and Domasig said that the grant made them better equipped to pursue a promising career in the future. Ledda cited Green Chefmanship, zero-waste management practices, and positive attitude development as among his important learnings at CEF. “I feel so blessed to be given the opportunity to continue my education. Through this, I aim to achieve my dream of becoming a culinary professional, and harness my skills as well as impart my learnings to others in our community,” Ledda said. “I am extremely proud to be a CEF scholar. With their guidance and trust, my batchmates and I are given new hope. I also thank Fly Ace Corp. for their support and Mr. Cochanco for referring us to the foundation. No words are enough to express my appreciation and gratitude,” said the 29-year-old Monterero. She used to work in a carinderia, while Ledda was a baker in a pan de sal store. 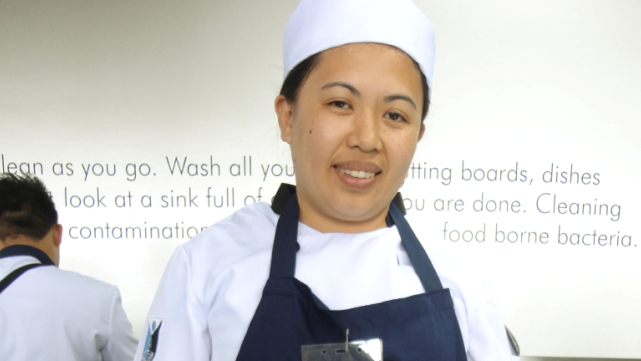 For Mendoza, a full-time helper and nanny, striving for a better future is made possible with the support of her employer, Jen Gumata of Fly Ace Corp., who let her focus on her classes during weekends. “I am very fortunate to have an understanding and supportive employer. Her encouragement really meant a lot in keeping me inspired in my studies. Together with my batchmates, we are looking towards better opportunities in life,” she said. “Corporate social volunteerism is vital in creating a bright future for the scholars and for the economic progress of the country. Together with Doña Elena brand of Fly Ace Corp., we will continue to coordinate advocacy efforts to support and provide scholarship opportunities to deserving students from poor communities,” said Susana “Annie” P. Guerrero, Founder and President of CEF. Dedicated to help promising individuals from low-income communities overcome the barriers by providing them mentorship, industry-grade standards, training, tools, and equal learning opportunities, CEF’s mission to help create meaningful difference in the lives of many aspiring students and their families will continue to live on. For more information, visit www.cefmanila.com.